The purpose of this paper is to gauge visual trends of ‘‘ecopreneur/ecopreneurship’’ field. 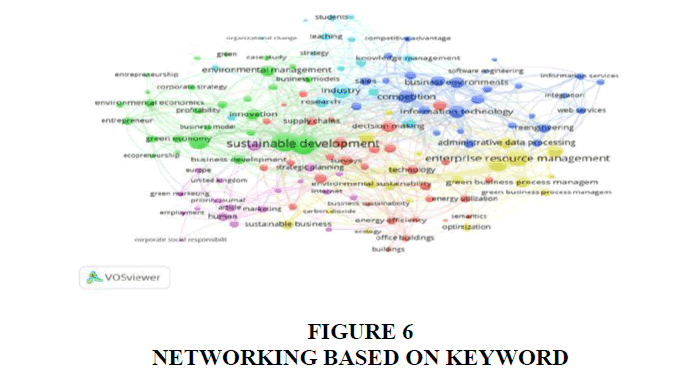 This survey identifies ecopreneurship-related keyword to search for and identify related articles in Scopus database for 595 academic articles that were published from 1978 to 2018. The 595 academics articles presented in histogram and pie chart. The findings are visual trends of an upsurge in the amount of publications each year, academic affiliation, authors, and subject area articles, keyword and authorship network. This literature review provides evidence that the thought of ecopreneur attracted academic researchers. World and people needs ecopreneur and ecopreneurship. Ecopreneur can be defined as “change driver entrepreneurs (Pastakia, 2002) who have founded new businesses on the basis of the principle of ecological (Kirkwood et al., 2014), sustainability (Walley & Taylor, 2002; Kirkwood & Walton (2014).” There is not one description of an ecopreneur (Mair et al., 2006). Ecopreneurs can be classified as opportunists, successful idealists, self-employed, and a non-profit business, if we see on the relationship between motivations and profits (Linnanen, 2002). Ecopreneurs aim to transform the business sector via challenging social and ethical norms (Isaak, 2002). Ecopreneur is those entrepreneurs who combine their business activities with environmental awareness in a push to shift the cornerstone of economic development towards a far more eco-friendly basis (Gibbs, 2006). An entrepreneur is an individual who convert ideas into commercial opportunities, value and manage finances wisely (Leach & Melicher, 2009). Unlike entrepreneurs generally, ecopreneurs are not motivated solely by monetary gains, but alternatively a desire to enhance the planet via their pre-existing green values. Ecopreneur is potentially leaders in altering consumer norms of behaviour to those that favour sustainability and the surroundings (Kearins & Collins, 2012). Ecopreneurs prioritise the environmental surroundings over profits whenever practical and are conscious of accomplishing the best they are able to lessen their affect the environment. Ecopreneurs may provide a win-win scenario for the economy and the environmental surroundings, along with enabling the ecopreneurs themselves to fulfill their very own personal goals Kirkwood & Walton (2014). The business activities undertaken by ecopreneur are named as ecopreneurship. Ecopreneur is a combination of the words “ecological” and “entrepreneur” (Schaltegger, 2002).Ecopreneur (ship) also known as “sustainable entrepreneur” (Cohen & Winn, 2007; Hall et al., 2010), “sustainable business” or “green business” (Cooney, 2009), “green entrepreneur” (Walley & Taylor, 2002), “environmental entrepreneur”or “enviropreneur”and “environmental business” (González-Benito & González-Benito, 2005). The research field of eco-preneurship covers many issues, a niche within entrepreneurship, came into the spotlight during the 1990s (Pastakia, 2002). Santini has research on research characteristic and trends of ecopreneur and ecopreneurship in aspect of characteristic, classifications, typology, and motivation (Santini, 2017). The study topic of ecopreneurship is increasing and new questions emerge, whilst others remain unanswered. Research offers an extensive literature review and aims to highlight research outputs and trends in ecopreneurship and argue that the number of ecopreneurs is growing because changes in lifestyles to focus more on organic food production, slow food movement, fair trade, and recycling initiatives (Holt, 2011). The contribution of entrepreneurship research for science can be calculated by the amount of citations in various perspectives (Luor et al., 2014). 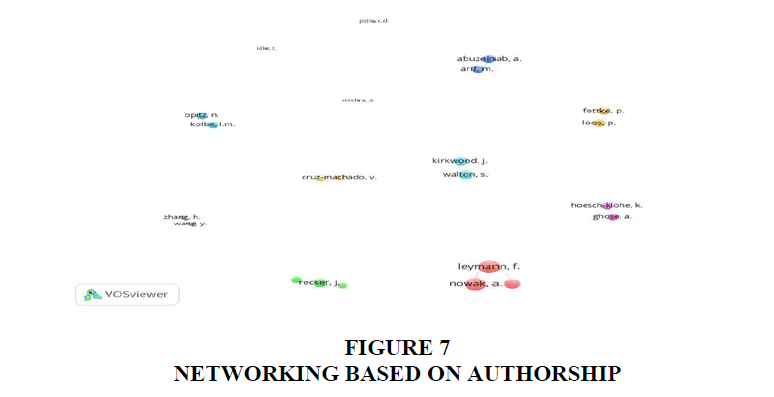 Co-authorship network useful for explore scientific collaboration among authors is really a relatively new research area (Uddin et al., 2012). Figure 1 show the article number of ecopreneurship-related per year (1978-2018). The most ecopreneur reseacher have focused primarily on small samples (Kirkwood et al., 2014; Pastakia, 2002; Schaltegger, 2002), or single case studies (Kearins & Collins, 2012; Mair et al., 2006), or literature review without visualization (Santini, 2017). There have been no studies have presented the big picture and visualization of ecopreneurship research trends. Then, research adopted the VOSviewer (Irawan et al., 2018; van Eck & Waltman, 2010). Research conduct a wide-ranging literature review and survey 595 ecopreneur and related articles that were published and indexed by the scopus database from 1978 to 2018 as shown in Figure 1. We replicated the method used by Irawan et al. (2018). Following keywords were used “ecopreneur” (OR) “green business” (OR) “environment business” in Scopus database to get 595 results. The literature database was harvested in CSV format. Its format was converted into RIS then fed it to VOSviewer, another open source app to analyse the text corpus from the RIS database. The raw dataset was stored in OSF repository (Irawan & Purnomo, 2018). As shown in Figure 2, in general, the amount of published ecopreneurship articles in accordance with the Scopus database is increasing every year. The highest peak of publication was in 2010, but decreased in 2011 and increased again in the following year. The largest number of citations was in 2004. Number of citations showed a downward trend since 2011 to present. The amount of citations is not related to the large amount of publications of ecopreneurship articles. Santini (2017) states that the research topic of ecopreneurship is increasing with new questions emerge, whilst others remain unanswered. The growth and the evolution of research on ecopreneurship can be “measured” also by the great discussion about ecopreneurship. The top 10 institutions in ecopreneurship publications are Queesland University of Technology, Universitat Stuttgart, University of Otago, Western Sydney University, Curtin University, Universiti Sains Malaysia, The University of Hong kong, Purdue University, University of Toronto, and National University of Singapore as shown in Figure 3. Ecopreneurship is still in the early stages of its development as a field of academic study, thus its further development in terms of theoretical contributions, questions to be asked, and research design must be understood in relation to its current status. Therefore, only a few universities in the world support the publication of ecopreneurship (Galkina & Hultman, 2016). The author with the largest amount of articles in the ecopreneurship field is Frank Leymann and Alexander Nowak from Universitat Stuttgart, Germany with seven articles as shown in Figure 4. Then, followed by researchers. The most subject area of ecopreneurship research is the business-management (38%), computer science (25%), engineering (24%), social sciences (22%), environmental science (15%) and economic (15%) as shown in Figure 5. 1. Dark Blue Cluster–Sub topic: business environments, information technology, competition. 2. Yellow Cluster–Sub topic: green business management, environmental sustainability, enterprise resource management. 3. Red Cluster–Sub topic: business sustainability, energy efficiency, energy utilization. 4. Pink Cluster–Sub topic: sustainable business, green marketing. 5. Green Cluster–Sub topic: sustainable development, green economy, environmental management. 6. Light Blue Cluster–Sub topic: knowledge management, research, industry. We see seven collaborative groups among authors in the field of ecopreneurship as shown in Figure 7, i.e. Abuzeinab & Arif (UK), Fettke & Loos (Germany), Kirkwood & Walton (New Zealand), Hoesch-klohe & Ghose (Australia), Leymann & Nowak (Germany), Zhand & Wang (China), and Opitz & Kolbe (Germany). Cooperation among researchers in the ecopreneurship field will increase the number and quality of publications and citation opportunities. There is increasing in entrepreneurship scholarship in the form of journal outlets, article publications, and university positions (Markin et al., 2017). This study aims to gauge visual trends of ‘‘ecopreneur/ecopreneurship’’ field. The findings this literature review provides evidence that the thought of ecopreneur attracted academic researchers. From the visualization, we can see that the topics of the papers are closely linked, but conversely, we do not see a good author citation connection. This study has limits on objectives, tools, and data sources. Study tries to investigate the visual trends and network to the ecopreneurship field. However, the study did not measure the contribution and impact of the research seen from the citation. Because, VosViewer as a research tool used is not designed to analyze citation. The analysis on this paper was only based on Scopus dataset, while there are obviously more relevant papers that are not indexed by Scopus, especially those that are written in local (non-English) language. For that, future research is to analyze the contribution and impact of the research by measuring the citation based on the combination of Scopus & WoS data. One tool for analyzing virtual citation and the creator is the same as VosViewer is CitNetExplorer. Cohen, B., & Winn, M.I. (2007). Market imperfections, opportunity and sustainable entrepreneurship. Journal of Business Venturing, 22(1), 29-49. Galkina, T., & Hultman, M. (2016). Ecopreneurship–assessing the field and outlining the research potential. Small Enterprise Research, 23(1), 58-72. Gibbs, D. (2006). Sustainability entrepreneurs, ecopreneurs and the development of a sustainable economy. Greener Management International, (55), 63–78. González-Benito, Ó., & González-Benito, J. (2005). Environmental proactivity and business performance: An empirical analysis. Omega, 33(1), 1-15. Hall, J.K., Daneke, G.A., & Lenox, M.J. (2010). Sustainable development and entrepreneurship: Past contributions and future directions. Journal of Business Venturing, 25(5), 439-448. Holt, D. (2011). Where are they now? Tracking the longitudinal evolution of environmental businesses from the 1990s. Business Strategy and the Environment, 20(4), 238-250. Irawan, D.E., Brahmantyo, B., Puradimaja, D.J., Priyono, I., & Darul, A. (2018). Visual research landscape of surface water and groundwater interactions (1980-2017). INA-Rxiv, 1-9. Irawan, D.E., & Purnomo, A. (2018). Eco-enterpreneurship-Meta analysis. Open Science Framework. Isaak, R. (2002). The Making of the Ecopreneur. Greener Management International, (38), 81-91. Kearins, K., & Collins, E. (2012). Making sense of ecopreneurs’ decisions to sell up. Business Strategy and the Environment, 21(2), 71-85. Kirkwood, J.J., Walton, S., Gray, B.J., Duncan, S., & Kirkwood, J. (2014). Encouraging sustainable entrepreneurship in climate- threatened communities: A Samoan case study. Entrepreneurship and Regional Development, 26(5-6), 401-430. Kirkwood, J., & Walton, S. (2014). How green is green? Ecopreneurs balancing environmental concerns and business goals. Australasian Journal of Environmental Management, 21(1), 37-51. Leach, C.J., & Melicher, R.W. (2009). Entrepreneurial finance in successful project management. Linnanen, L. (2002). An insider’s experiences with environmental entrepreneurship. Greener Management International, (38), 71-80. Luor, T., Lu, H.P., Yu, H., & Chang, K. (2014). Trends in and contributions to entrepreneurship research: A broad review of literature from 1996 to June 2012. Scientometrics, 99(2), 353-369. Mair, J., Robinson, J., & Hockerts, K. (2006). Navigating social and institutional barriers to markets: How social entrepreneurs identify and evaluate opportunities. Social Entrepreneurship, 95-120. Markin, E., Swab, R.G., & Marshall, D.R. (2017). Who is driving the bus? An analysis of author and institution contributions to entrepreneurship research. Journal of Innovation & Knowledge, 2(1), 1-9. Pastakia, A. (2002). Assessing ecopreneurship in the context of a developing country: The case of India. Greener Management International, 93-109. Santini, C. (2017). Ecopreneurship and ecopreneurs: Limits, trends and characteristics. Sustainability, 9(4), 492. Schaltegger, S. (2002). A framework for ecopreneurship. Greener Management International, (38), 45-58. Uddin, S., Hossain, L., Abbasi, A., & Rasmussen, K. (2012). Trend and efficiency analysis of co-authorship network. Scientometrics, 90(2), 687-699.
van Eck, N.J., & Waltman, L. (2010). Software survey: VOSviewer, a computer program for bibliometric mapping. Scientometrics, 84(2), 523-538. Walley, E.E., & Taylor, D.W. (2002). Opportunists, champions, mavericks...?A typology of green entrepreneurs. Greener Management International, (38), 31-43.